If you're after a basic tablet with the latest Android 4.1 Jelly Bean OS to play host primarily to browse the web and don't want to go near the almost-phone-sized seven-inch tablet market, the Toshiba AT300SE could be the one for you. Compared to its Toshiba AT300 ancestor, the Toshiba AT300SE sees the same Nvidia Tegra 3 quad-core mobile processor and features a 5th battery-saver core, but uses the latest Android 4.1 Jelly Bean OS. It also receives a £30 discount, taking the price down to £299 in the UK and US$349.99 in the US, where it's called the Excite 10 SE. The tablet's cheaper price is achieved by using a slightly thicker (10.5mm vs 8.9mm), heavier (625g vs 589g) chassis, a less able camera (3MP rear, 1.2MP front vs 5MP and 2MP) and a less comprehensive array of ins and outs. However, with the Toshiba AT300 suffering from a lack of speed, the Toshiba AT300SE is all about that processor, and it ought to lift it ahead of some rivals. Core specs-wise this 16GB, Wi-Fi-only tablet is placed to complete very aggressively on price with the equivalent iPad 4 and other high-end Android tablets such as the Google Nexus 10 and Samsung Galaxy Note 10.1. 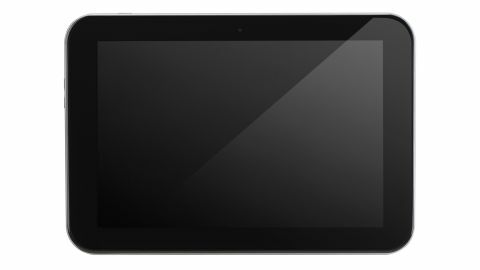 In its peer group, however, it's slightly pricier than the Asus Iconia A210 and Sony Tablet S.
However, the probable reason for the Toshiba AT300SE's reappearance as a slightly lower-spec tablet is to challenge the Samsung Galaxy Tab 2 10.1, which sells for the same as the Toshiba AT300's initial price. Measuring 261 x 180 x 10.5mm (10.3 x 7.1 x 0.4 inches) and weighing 625g (22oz), the Toshiba AT300SE has a 10.1-inch IPS LCD 10-finger touch display and an aspect ratio of 16:10. It feels solid, and we had no qualms about putting it in hand luggage for a flight without a cover. Its mottled grey back panel makes it stay in place when holding it, though the Toshiba AT300SE's back panel is noticeably more bulky than the Toshiba AT300, with a much more pronounced curve than both its older sister and the iPad 3, while the bezel around the screen stretches to 18mm (0.7 inches) behind the glass. That's exactly the same as an iPad. Compared to a Toshiba AT300, the Toshiba AT300SE lacks a metallic strip along the top to house camera and flash, and completely lacks a flash. This incarnation uses a printed Toshiba logo instead of an engraved version, too. Note here that although the Toshiba AT300 has an LED-backlit display and the Toshiba AT300SE does not; in practice there was no noticeable difference in viewing angles, colour richness or contrast in our side-by-side test. The brightness does reduce when the screen is tipped, but it's the same on both tablets. The resolution is an HD-capable 1280 x 800 pixels - no change there - though that's vastly fewer than the iPad's 1536 x 2048 on a smaller screen - and the pixel structure is visible if you're looking for it. Whether that 149ppi troubles you will depend on what you want a tablet for - but it's a sticking point for us. Though there's no 3G option, the Toshiba AT300SE's connectivity has been expanded and streamlined since the original Toshiba AT300. Gone is the bulky, proprietary charger that plugged into the tablet's longer side, replaced by a micro USB port. It's less to carry around if nothing else. The left side - if using the tablet in landscape orientation - features a headphones slot, volume rockers, that micro USB slot, and a microSD card slot for expanding beyond the 16GB solid state drive. Nice. Speakers are down-facing on the undercarriage, while the standby button is on the top. 'Proper' keyboard and wireless headphones fans (if there are any), will appreciate the Toshiba AT300SE's Bluetooth 3.0 brains. The Toshiba AT300SE runs on an Nvidia Tegra 3 quad-core processor running at 1.3GHz, with 1GB of RAM, though Toshiba's impressive Resolution+ video improvement circuitry has been sacrificed. Button placing makes sense in both orientations, and we love the new micro USB cable and bundled wall charger, but what about HDMI out? It seems that the price saving achieved with the Toshiba AT300SE has come at the cost of that, as well as slimness and a lower-spec screen.